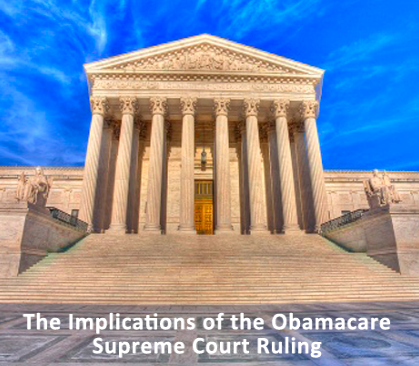 Last Friday, the Supreme Court granted certiorari in King v. Burwell. Although it was a relist from last week’s conference—increasing the odds of granting certiorari to 49%–the quickness of the announcement caught many by surprise. Following the Court’s announcement, legal experts have expressed disagreement over the merits of the case: both proponents and detractors of the plaintiff’s claim assert that King is a simple case of statutory interpretation, while reaching opposite judgments. (See e.g., here, here, and here). Ignoring the legal disagreements, King presents an interesting case for another reason—the outcome of the case has significant political ramifications. With the Republicans now in control of the Senate, many conservatives are calling for a full-repeal of the Patient Protection and Affordable Care Act (ACA). However, even Senator Mitch McConnell has conceded that a full-repeal of the ACA is all but impossible—the Republicans simply do not have the 60-votes necessary to override a presidential veto. Many detractors have identified King as an alternative mechanism by which to repeal the ACA. Due possibly to a drafting error or an intended provision with unintended consequences (most expected states to establish their own exchanges), the Supreme Court could construe section 1401 of the ACA to limit federal subsidies to only those exchanges established in the states. As thirty-six states declined to establish their own exchange and eighty-six percent of those enrolled in exchanges are on subsidies, the loss of these subsidies would devastate the federal exchanges in the thirty-six states. A plaintiff victory would immediately harm individuals dependent upon those subsidies for their insurance. It is estimated that nearly four million of the projected six-and-a-half-million people in the exchange at year-end will be receiving subsidies. In order to keep pace with the CBO projections, the number of individuals in exchanges will have to nearly double to thirteen million by the end of 2015. Assuming the ratio of number on subsides to number in the exchange remains constant, around eight-million people will be receiving subsidies by the end of 2015. If the Court ruled in favor of the plaintiff, any individual who resides in one of the thirty-six states would become ineligible to receive federal subsidies. As people receiving subsidies are paying, on average, only one-fourth of their premiums, it is likely that a majority of these individuals will no longer be able to afford insurance through the exchange and leave the exchange altogether. If a high percentage of these individuals opt out of the exchange, immense pressure will be placed on insurers in these thirty-six states. Indeed, it may drive insurers out of the federal-exchanges and threaten the viability of these exchanges altogether. At least initially, insurers would be insulated from the effects of a plaintiff victory. Most strikingly, eighty to ninety percent of insurers’ losses are protected (sustained by taxpayers) through two risk-sharing provisions in the ACA: Claim Reinsurance and the Risk Corridor Programs. Claim Reinsurance covers insurance losses between seventy-thousand dollars and two-hundred-and-fifty-thousand dollars. The Risk Corridor Program covers seventy-five percent of all losses above two-hundred-and-fifty-thousand dollars. Thus, insurers would be on the hook for only the first seventy-thousand dollars of losses and only twenty-five percent of losses above two-hundred-and-fifty-thousand dollars. For other reasons insurers may not be immediately affected by a plaintiff victory. The Court will likely release its decision at the end of June or beginning of July but insurers are required by law to operate for the rest of the year. Moreover, insurers cannot cancel individual plans but must cancel whole classes of plans. Lastly, if an insurer leaves the market, they are prevented from reinterring the market for the next five years pursuant to Health Insurance Portability and Accountability Act (HIPAA). For these reasons, insurers may have enough of an incentive to stay in the sans-subsidies exchange and wait to if the state elects to establish their own state-run exchanges. If there is intransigence, then insurers may eventually leave the market. In some states, the outlook looks even worse. For some of these thirty-six states, co-ops are central to the insurance market in the exchange. For instance, in Iowa, Nebraska, Maine, and Montana, co-ops control nearly one-half of the market. The loss of subsidies and corresponding people in the exchanges would destroy these co-ops, thereby devastating the insurance market in these states. A plaintiff victory may score Republicans some political points. It could be portrayed as just another example of the unworkability of the law. It could also be presented as another example of the Obama administration flouting the rule of law. This portrayal of an ACA victory would fit with the current narrative of the Obama presidency: The ACA has been an administrative nightmare and the Obama has garnered a reputation for using executive orders to bypass congressional intransigence. One architect of the law, Michael Canon, has tried to argue that as these lawsuits seek to uphold the ACA as it was written, the negative consequence can be directly attributed to the ACA. But such a subtle rhetorical maneuver will be a difficult sell to the citizenry writ large. Overall, it seems much more likely that a plaintiff victory would be politically harmful to republicans. If the Court were to side with the plaintiffs, it would likely fall on political lines with the five Republican-appointed Justices siding with King and the four Democratic-appointed Justices siding with the administration. Such a result would be undoubtedly chided as politically motivated. In fact, the one commentator already denigrated the grant of certiorari as a “naked power grab” by the conservative Justices on the Court. Additionally, a plaintiff victory will harm state Republican politicians. First, the effect of plaintiff victory will be felt only in the thirty-six states that did not establish their own exchanges. The states that did not set up exchanges are generally more conservative, typically led by Republican state legislatures and Republican governors. These Republican incumbents will likely face the brunt of criticism and responsibility for the maelstrom wreaking havoc to the exchanges. Especially, when these citizens will be able to witness the Obamacare functioning in state-exchanges in a neighboring state. By imploding the exchanges in predominantly Republican states and allowing the ACA to operate unimpeded in neighboring blue states, a plaintiff victory would present a comparison that may validate the ACA as a health care policy. If the plaintiff loses, the ACA is left intact. But this may not be a bad thing. The ACA is likely to become more unpopular leading up to the all-important 2016 presidential election. The ACA needs to effectively double exchange enrollment in 2015 to keep pace with the CBO projection. This seems unlikely, however, as the CBO has recently reduced its estimate and enrollment is currently bleeding at three percent per month. There is no reason to think individuals who declined to enroll in an exchange in 2014, would suddenly be amenable to do so in 2015. Additionally, the ACA stands on its own in 2017, therefore when the electorate goes to the polls in 2016, everyone will be seeing for the first time their true, unadulterated premium rates. King presents an important case on statutory interpretation and will have important implications for administrative law. In order to resolve this legal question, the Court may be forced to “gut” the ACA and set off these devastating political consequences. The judicious conservative should hope the legislature, not the Supreme Court decides the fate of the ACA. Tags: Affordable Care Act, Obamacare, supreme court. Bookmark the permalink.